Over the next few weeks, I’ll be sharing various posts on freezer-friendly recipes! Whether you’re always on the go and need quick meals or just would love to stock up your freezer with healthy dinner ideas, I’ve got you covered! First up, these Freezer-Friendly Quinoa Meatballs. Not only are freezer-friendly recipes a time saver, they’re perfect for (almost) new moms such as Katie from Katie’s Cucina! Today, a group of food bloggers and I have come together to celebrate Katie’s pregnancy in a virtual baby shower. The internet is rejoicing by sharing delicious recipe ideas for new moms, so be sure to scroll down and check out what the rest of the bloggers made. We can’t wait to see tweets and photos of the new baby boy!! While visiting my best friend who just had a baby a month ago, as well as a 22 month old toddler, I promised myself to make her life easier by stocking her freezer and pantry with prepared meals and snacks. Estelle, the 22-month old toddler, is a lover of all things food, as you can see here, here, and here. The brand new addition to the family, Nora, basically just sleeps all day as you can see here and here. So while balancing both, as well as trying to let the new mom sleep, go on a date with her husband, and get a pedicure, I made freezer meals, like these meatballs. These Quinoa Meatballs were a hit with the entire family! Blended ground beef or turkey with quinoa, fresh vegetables, and spices, baked and frozen make these an easy meal to reheat and get dinner on the table in less than 15 minutes. Pair with buttered egg noodles for toddlers or serve your hubby a big bowl of meatballs in tomato sauce over spaghetti, and this is a new mom’s dream come true. If you’re trying to watch your carb intake, serve these meatballs alongside a gorgeous salad of mixed greens and you’re good to go! Thanks to Ancient Harvest Quinoa, we tested this recipe with a variety of quinoa (white, red, and black) and the results were always fantastic! 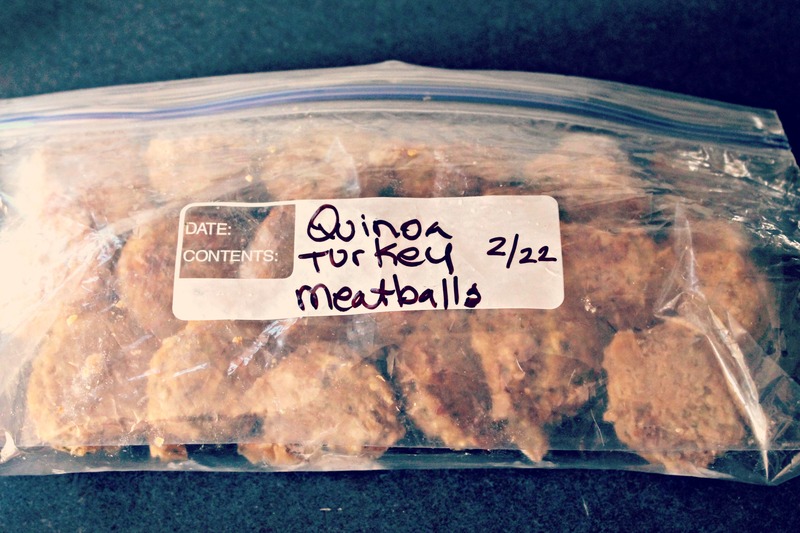 Quinoa not only extends the ground meat to make more meatballs (frugal save!) but it also adds great fiber and nutrients. Organic, Non GMO & Gluten Free quinoa from a company we love and trust makes this recipe outstanding and one you’ll feel good about when serving to your kids. These Quinoa Meatballs are healthier than their traditional version because of the inclusion of cooked quinoa, adding fiber and nutrients to them! In a food processor or blender, mix the cilantro, pepper, onion, and garlic until finely blended. In a large bowl, mix together the blended vegetables, raw ground beef or turkey, quinoa, and egg. Knead meat mixture until all ingredients are fully incorporated. Using a small ice cream scoop, scoop and shape into balls and place on a baking tray. Once you've scooped all the mixture, place in oven and bake for 15-20 minutes, until meatballs are fully cooked. You can serve these right away or make freezer-friendly. To make freezer-friendly: Remove from oven and chill. Transfer to a smaller and clean baking tray (one that fits in your freezer) and place cooked meatballs in a single layer. Freeze until solid all the way through. Place meatballs in a lastic baggie, dated and sealed and store in freezer until time to use. You can also mix your ground meat with Italian sausage out of the casing. This gives the meatballs extra flavor! To reheat: pop them back in the oven for 10 minutes or in the microwave for 2-3 minutes. If you're making a sauce, just place the frozen meatballs in the sauce while it cooks. I Love to make food a head of time and thow it in to​ the Freezer for meals to. We just started eating quinoa in the last year and I am currently obsessed with it. Love that you added it to meatballs…I will definitely have to try that out!!! I love freezer meals and the addition of quinoa is awesome. Great recipe! This is so clever! I love it! Thanks so much for joining in the shower for Katie! I love freezer-friendly meals and these meatballs look so scrumptious! A must try for sure! Can’t wait to try these awesome little turkey quinoa balls !! All over this! We have ground chicken in the freezer, so I’m going to have to try a little swaperoo for the turkey. I’ll let you know how it goes! Thank you for joining in on the surprise and showering me with love and recipes! It’s funny you posted about meatballs because I’ve requested my mom to make a few batches of her meatballs to freeze. Now I think I need to give your recipe a try, too! I *adore* that these are healthy AND freezer-friendly. Such a great idea, Marnely! Thanks for joining with us to celebrate Katie’s baby today! Love the added protein in these!! Also the freezing idea is genius. I love that you can freeze these. This is exactly what a new mom needs, freezable recipes that are also healthy!